Septic embolism (SE) constitutes an important yet often under-reported class of infectious complications. SE can be associated with a wide range of both early and late sequelae. Among immediate complications is the vascular occlusion of the downstream vascular tree, including devastating sequelae such as cerebral [Figure 1], bowel, or myocardial infarction. Among late complications are mycotic aneurysms  and abscesses. Of additional concern is that SE can be a source of recurrent infection even if the primary focus is surgically cleared. Literature in this clinical area continues to be limited, with predominance of case reports, historical anecdotal teachings, and small series. Consequently, there is a great need for a single, comprehensive review source that summarizes all common forms of septic arterial embolism. This review aims to fill this important information gap. Bacterial endocarditis, septic thrombophlebitis, periodontal, and central venous catheter infections constitute a group of primary disorders most frequently associated with SE. Other implanted intra-vascular devices can also become sources of infection.With the aging population, advances in technology, and broader application in patients with multiple established high-risk comorbidities (i.e. obesity, diabetes, chronic immunosuppression, renal failure, malignancies, etc.) the use of implantable pacemakers, defibrillators, ventricular-assisted devices, and chronic vascular access devices is becoming more common. The thrombogenic propensity associated with peri-arterial infections has also been described as well as the difficulties in clearing bacterial biofilms with antibiotics alone. Although quite heterogeneous in character, all of the above-listed factors have the potential to produce SE. Although not directly related to arterial embolization, venous embolic phenomena deserve a brief mention in this review, especially in the context of pulmonary and paradoxical embolization. , In addition to local and regional symptoms, septic phlebitis can also be associated with more distal or remote embolic sequelae. For example, septic pulmonary embolism has been reported in cases of septic phlebitis. In one case, lung nodules consistent with SE were believed to result from a fistula between the vena cava and the jejunum following an esophago-jejunal anastomosis. In another case, paradoxical SE to the brain were reported through a patent foramen ovale. Moreover, bacteremia from a presumed venous source can infect prosthetic or abnormal (i.e. bicuspid aortic valves, severe myxomatous or degenerative mitral valves, etc.) heart valves causing endocarditis and setting the stage for later arterial embolization. Cerebral SE [Figure 1] usually results from fragmentation and/or dislodgment of cardiac vegetations, followed by vessel occlusion and corresponding degrees of ischemia and infarction, depending on vessel size, location, and collateral blood flow. Cerebral arterial occlusion, resulting in either infarction or transient ischemic attack, accounts for 40-50% of central nervous system (CNS) complications of infective endocarditis. More than 40% of cerebral emboli affect the middle cerebral artery. In a study of nearly 198 ICU patients with left-sided infective endocarditis, 108 experienced a total of 197 neurologic sequelae, of which ischemic strokes constituted approximately 40%. Other CNS complications in this group included cerebral hemorrhage, meningitis, brain abscess, and mycotic aneurysm. Secondary abdominal aortic aneurysm infections have been reported in the setting of remote infection. In one case, such infection followed a presumed septic embolization from an abdominal abscess source. Others reported a ruptured mycotic aortic abdominal aneurysm with evidence of septic emboli in a child after the resection of an infected cardiac myxoma. In another report, inflammatory changes were noted in the walls of arteries adjacent to an intracranial hematoma secondary to septic embolization. Due to frequently non-specific or atypical presentations in these cases, a high index of clinical suspicion is required when approaching patients presenting with infections of arterial structures. Coronary embolization from a septic focus has been well reported. Such septic emboli most often originate from bacterial vegetations  but other infectious sources have also been described. Coronary embolization should be considered in any patient with known or suspected left-sided endocarditis and concurrent ECG and/or laboratory evidence of acute myocardial ischemia. Of note, ECG changes secondary to coronary artery SE are distinct, more suggestive of ischemia and usually not related to ECG changes secondary to the destruction of the cardiac conduction system that may occur when an infection involving the aortic valve and/or aortic root erodes into the surrounding cardiac structures. Echocardiography, especially the trans-esophageal echocardiography, can reliably demonstrate the presence of valvular vegetations in this setting. Frequently fatal, coronary occlusion from SE can be diagnosed via coronary angiography. After the diagnosis is established, emergent management involving intravascular thrombectomy has been reported to be successful. Acutely occluded major coronary arteries or branches may require surgical revascularization at the time of valve surgery. Patients with aortic valve endocarditis, in whom preoperative coronary angiography may be contraindicated due to concerns of dislodging debris, may require empiric grafting. Mesenteric arterial embolization is relatively uncommon, with most cases limited to patients with atherosclerotic plaques or atrial fibrillation. Infected intracardiac thrombi and/or vegetations have the potential to embolize distally and cause mesenteric arterial occlusion. Presentation of septic mesenteric embolism includes peritonitis, infarctions in the corresponding anatomic distributions and end-organ structures. Recognition of this clinical entity involves high index of suspicion and the presence of appropriate clinical context (i.e., the presence of bacterial endocarditis). This can be particularly problematic in the post-operative period when a patient, who had been previously doing well, presents with signs and symptoms of an acute abdomen.Given the circumstances, there should be a low threshold for early surgical intervention-even with mild or non-specific symptoms. Surgical exploration in the setting of acute abdominal sepsis often reveals extensive bowel ischemia from multiple diffuse emboli. Multiple areas of necrosis (particularly if the patient was on high-dose post-operative inotropic or vasoactive medications in which already compromised bowel is further rendered ischemic) and free perforation may require extensive resections. Even with modern management approaches, the mortality rate is high after septic embolization to the mesenteric vessels. In addition, mortality associated with post-operative complications also continues to be high. Management depends on the damage already inflicted by the septic process and involves prompt initiation of antibiotic therapy and surgery as indicated. Splenic abscess complicating infectious endocarditis is a well-known clinico-pathologic entity. With the advent of high resolution CT imaging, the occurrence of splenic SE turned out to be much higher than previously estimated, giving support to the phenomenon of "asymptomatic" septic embolization. Abdominal CT is very effective in confirming the diagnosis of SE of the spleen. Approximately 50% of patients with this entity require splenectomy, with surgical indications including persistent sepsis (60% cases), large lesions (>2cm), peripheral lesions (30%), and splenic rupture (10%). In such cases, splenectomy, or percutaneous abscess drainage in patients who are poor surgical candidates, is often indicated prior to definitive management of cardiac valve pathology. Despite modern clinical approaches, early infection-directed therapy, and better critical care capabilities, SE continues to significantly affect the critically ill population. In addition to early clinical recognition, prompt identification of the underlying infectious source and immediate goal-directed antibiotic therapy are all critical to successful management of septic embolism. More widespread awareness of risk factors, clinical presentation, and management of septic embolism is needed in the modern intensive care unit. 1. CaraballoV. Fatal myocardial infarction resulting from coronary artery septic embolism after abortion: Unusual cause and complication of endocarditis. Ann Emerg Med 1997;29:175-7. 2. Cassada DC, Stevens SL, Schuchmann GS, Freeman MB, Goldman MH. Mesenteric pseudoaneurysm resulting from septic embolism. Ann Vasc Surg 1998;12:597-600. 3. Molinari GF. Septic cerebral embolism. Stroke 1972;3:117-22. 4. Fidan F, Acar M, Unlu M, Cetinkaya Z, Haktanir A, Sezer M. Septic pulmonary emboli following infection of peripheral intravenous cannula. Eur J Gen Med 2006;3:132-5. 5. Dickman FN, Moore IB. Mycotic aneurysms: A case report of a popliteal mycotic aneurysm. Ann Surg 1968;167:590-4. 6. Millaire A, Leroy O, Gaday V, de Groote P, Beuscart C, Goullard L, et al. Incidence and prognosis of embolic events and metastatic infections in infective endocarditis. Eur Heart J 1997;18:677-84. 7. Bradley JT, Orr NM, Ramachandran S. Presence of concomitant asymptomatic and symptomatic emboli resulting from acute staphylococcus aureus endocarditis. Med Forum 2005;7:5. 8. Ting W, Silverman NA, Arzouman DA, Levitsky S. Splenic septic emboli in endocarditis. Circulation 1990;82 Suppl 5:IV105-9. 9. Avery RK, Barnes DS, Teran JC, Wiedemann HP, Hall G, Wacker T, et al. Listeria monocytogenes tricuspid valve endocarditis with septic pulmonary emboli in a liver transplant recipient. Transpl Infect Dis 1999;1:284-7. 10. Miller FH, Ma JJ. Total splenic infarct due to Aspergillus and AIDS. Clin Imaging 2000;24:362-4. 11. Bach MC, Roediger JH, Rinder HM. Septic anaerobic jugular phlebitis with pulmonary embolism: Problems in management. Rev Infect Dis 1988;10:424-7. 12. Byrne JG, Rezai K, Sanchez JA, Bernstein RA, Okum E, Leacche M, et al. Surgical management of endocarditis: The society of thoracic surgeons clinical practice guideline. Ann Thorac Surg 2011;91:2012-9. 13. Allie DE, Lirtzman MD, Wyatt CH, Vitrella DA, Walker CM. 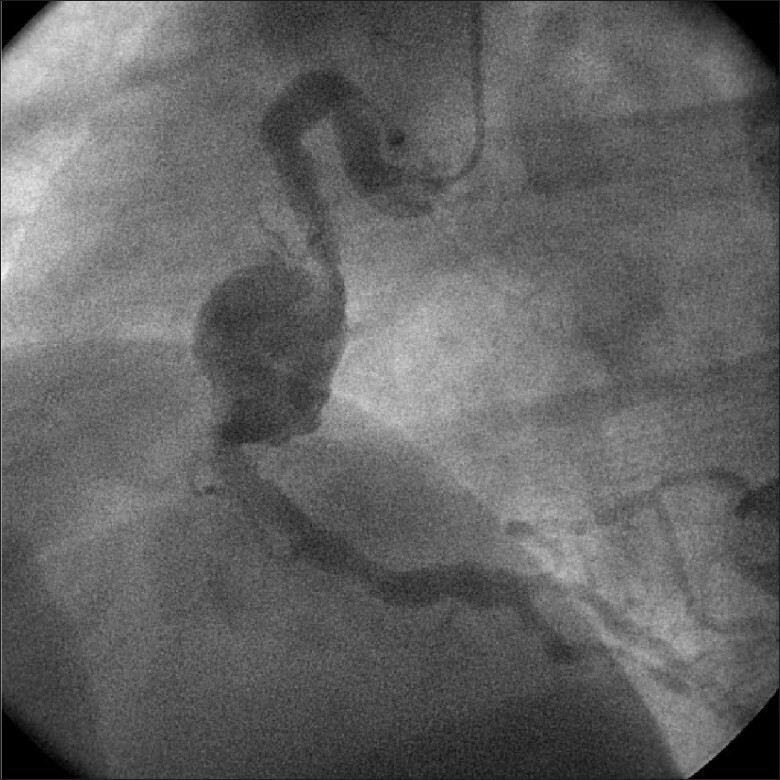 Septic paradoxical embolus through a patent foramen ovale after pacemaker implantation. Ann Thorac Surg 2000;69:946-8. 14. 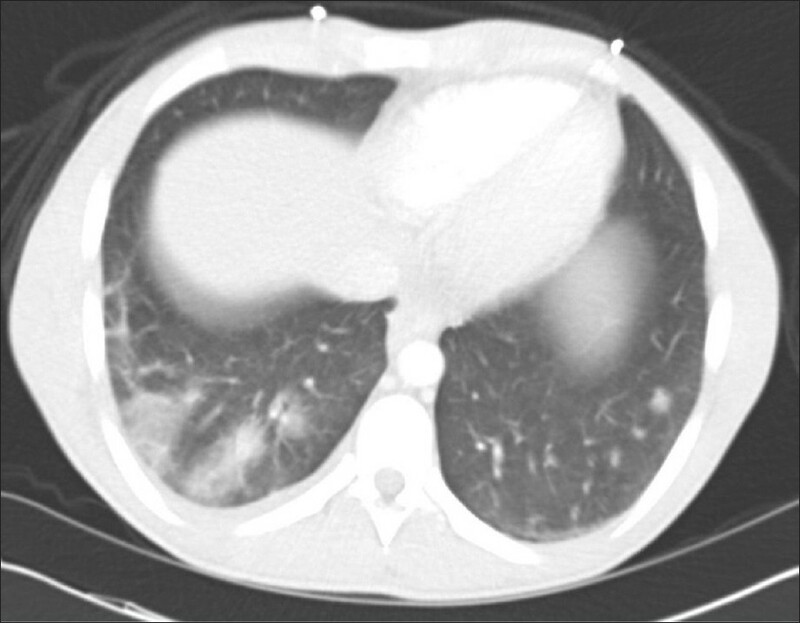 Kuhlman JE, Fishman EK, Teigen C. Pulmonary septic emboli: Diagnosis with CT. Radiology 1990;174:211-3. 15. Young SO, Knechtges PM. Fistula between the jejunum and the inferior vena cava after esophagojejunal anastomosis. Case Rep Gastroenterol 2011;5:546-52. 16. Rossi SE, Goodman PC, Franquet T. Nonthrombotic pulmonary emboli. AJR Am J Roentgenol 2000;174:1499-508. 17. Yang PW, Lin HD, Wang LM. Pyogenic liver abscess associated with septic pulmonary embolism. J Chin Med Assoc 2008;71:442-7. 18. Osei C, Berger HW, Nicholas P. Septic pulmonary infarction: Clinical and radiographic manifestations in 11 patients. Mt Sinai J Med 1979;46:145-8. 19. Ghaye B, Trotteur G, Dondelinger RF. Multiple pulmonary artery pseudoaneurysms: Intrasaccular embolization. Eur Radiol 1997;7:176-9. 20. 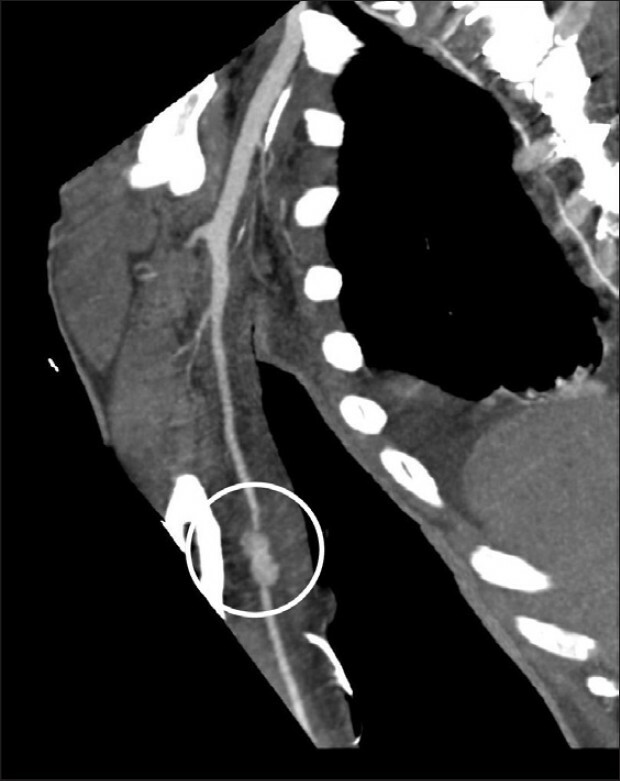 Deshmukh H, Rathod K, Garg A, Sheth R. Ruptured mycotic pulmonary artery pseudoaneurysm in an infant: Transcatheter embolization and CT assessment. Cardiovasc Intervent Radiol 2003;26:485-7. 21. Ozbek C, Yetkin U, Bademci M, Karahan N, Gurbuz A. Ring annuloplasty and successful mitral valve repair in a staphylococcal endocarditis case with bilobular saccular mycotic aneurysm at cerebral artery and frontal region infarction secondary to septic emboli. Arch Med Sci 2008;4:94-9. 22. Sonneville R, Mirabel M, Hajage D, Tubach F, Vignon P, Perez P, et al. Neurologic complications and outcomes of infective endocarditis in critically ill patients: The ENDO cardite en RE Animation prospective multicenter study. Crit Care Med 2011;39:1474-81. 23. Sonneville R, Mourvillier B, Bouadma L, Wolff M. Management of neurological complications of infective endocarditis in ICU patients. Ann Intensive Care 2011;1:10. 24. Dickerman SA, Abrutyn E, Barsic B, Bouza E, Cecchi E, Moreno A, et al. The relationship between the initiation of antimicrobial therapy and the incidence of stroke in infective endocarditis: An analysis from the ICE Prospective Cohort Study (ICE-PCS). Am Heart J 2007;154:1086-94. 25. Hart RG, Kagan-Hallet K, Joerns SE. Mechanisms of intracranial hemorrhage in infective endocarditis. Stroke 1987;18:1048-56. 26. Pruitt AA, Rubin RH, Karchmer AW, Duncan GW. Neurologic complications of bacterial endocarditis. Medicine (Baltimore)1978;57:329-43. 27. Heiro M, Nikoskelainen J, Engblom E, Kotilainen E, Marttila R, Kotilainen P. Neurologic manifestations of infective endocarditis: A 17-year experience in a teaching hospital in Finland. Arch Intern Med 2000;160:2781-7. 28. Rogers AJ, Rowlands BJ, Flynn TC. Infected aortic aneurysm after intraabdominal abscess. Tex Heart Inst J 1987;14:208-14. 29. Guler N, Ozkara C, Kaya Y, Saglam E. Ruptured abdominal aortic aneurysm after resection of an infected cardiac myxoma. Tex Heart Inst J 2007;34:233-5. 30. Taniike M, Nishino M, Egami Y, Kondo I, Shutta R, Tanaka K, et al. Acute myocardial infarction caused by a septic coronary embolism diagnosed and treated with a thrombectomy catheter. Heart 2005;91:e34. 31. Whitaker J, Saha M, Fulmali R, Perera D. Successful treatment of ST elevation myocardial infarction caused by septic embolus with the use of a thrombectomy catheter in infective endocarditis. BMJ Case Rep 2011;2011:pii: bcr0320114002..
32. Kessavane A, Marticho P, Zogheib E, Lorne E, Dupont H, Tribouilloy C, et al. Septic coronary embolism in aortic valvular endocarditis. J Heart Valve Dis 2009;18:572-4. 33. Vasconcelos CP, Ferraz Neto BH, Fonseca LE, Cal RG. Mesenteric ischemia caused by embolism in atrial fibrillation. Rev Assoc Med Bras 2005;51:309. 34. Stamatakos M, Stefanaki C, Mastrokalos D, Arampatzi H, Safioleas P, Chatziconstantinou C, et al. Mesenteric ischemia: Still a deadly puzzle for the medical community. Tohoku J Exp Med 2008;216:197-204. 35. Misawa S, Sakano Y, Muraoka A, Yasuda Y, Misawa Y. Septic embolic occlusion of the superior mesenteric artery induced by mitral valve endocarditis. Ann Thorac Cardiovasc Surg 2011;17:415-7. 36. Edwards MS, Cherr GS, Craven TE, Olsen AW, Plonk GW, Geary RL, et al. Acute occlusive mesenteric ischemia: Surgical management and outcomes. Ann Vasc Surg 2003;17:72-9. 37. Lyden SP, Tanquilut EM, Gavin TJ, Adams JE. Aortoduodenal fistula after abdominal aortic stent graft presenting with extremity abscesses. Vascular 2005;13:305-8. 38. Mohammadzade MA, Akbar MH. Secondary aortoenteric fistula. Med Gen Med 2007;9:25. 39. Martin A, Copeman PW. Aorto-jejunal fistula from rupture of Teflon graft, with septic emboli in the skin. Br Med J 1967;2:155-6. 40. Wang YJ, Wen SC, Chien ST, King J, Hsuea CW, Feng NH. Liver abscess secondary to sigmoid diverticulitis: A case report. J Intern Med Taiwan 2005;16:289-94. 41. Sabbaj J. Anaerobes in liver abscess. Rev Infect Dis 1984;6Suppl 1:S152-6. 42. Chou FF, Sheen-Chen SM, Chen YS, Chen MC. Single and multiple pyogenic liver abscesses: Clinical course, etiology, and results of treatment. World J Surg 1997;21:384-8;discussion 388-9. 43. Wallack MK, Brown AS, Austrian R, Fitts WT. Pyogenic liver abscess secondary to asymptomatic sigmoid diverticulitis. Ann Surg 1976;184:241-3. 44. Onder A, Kapan M, Boyuk A, Gumus M, Tekbas G, Girgin S, et al. Surgical management of pyogenic liver abscess. Eur Rev Med Pharmacol Sci 2011;15:1182-6. 45. Sharma BC, Garg V, Reddy R. Endoscopic management of liver abscess with biliary communication. Dig Dis Sci 2012;57:524-7. 46. Haigh E. Acute pancreatitis in childhood. Arch Dis Child 1956;31:272-5. 47. Sheil AG, Reeve TS, Little JM, Coupland GA, LoewenthalJ.Aorto-intestinal fstulas following operations on the abdominal aorta and iliac arteries. Br J Surg 1969;56:840-3. 48. Katsura M, Gushimiyagi M, Takara H, Mototake H. True aneurysm of the pancreaticoduodenal arteries: A single institution experience. J Gastrointest Surg 20120;14:1409-13. 49. Johnson JD, Raff MJ, Barnwell PA, Chun CH. Splenic abscess complicating infectious endocarditis. Arch Intern Med 1983;143:906-12.